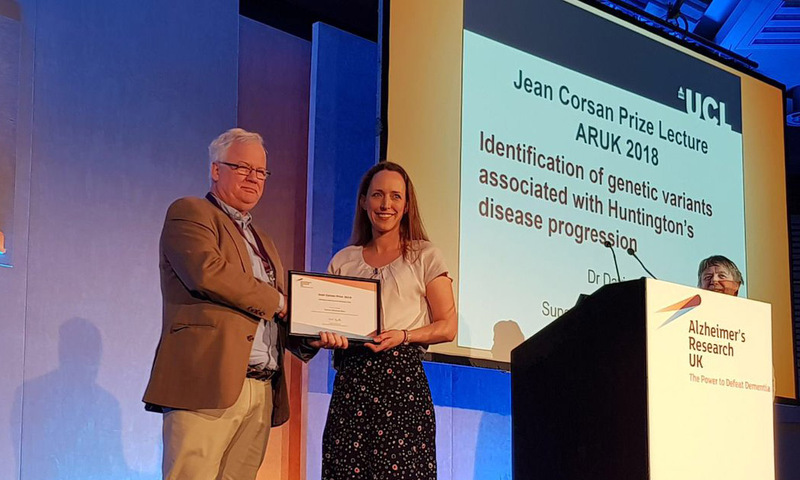 Congratulations to Dr Davina Hensman Moss, UCL Institute of Neurology (IoN), who has won the Jean Corsan Prize for best scientific paper published by a PhD student at the Alzheimer's Research UK's 2018 Research Conference. Dr Hensman Moss is a Neurology Registrar and Clinical Fellow to Professor Sarah Tabrizi at the IoN's Department of Neurodegenerative Disease and the National Hospital for Neurology and Neurosurgery. Her research focuses on Huntington's disease, which is an inherited condition caused by a faculty gene which affects the nervous system and can impact movement, learning, thinking and emotions. Specifically, Dr Hensman Moss is interested in why Huntington's progresses more slowly in some people than in others, because knowing what modulates disease progression will provide targets for future therapies. In the winning research paper, published in June 2017, she found that a version of a gene encoding for DNA repair affects the progression of Huntington's disease. She explained to ARUK, "Huntington's disease is caused by an expansion mutation - a stretch of repetitive DNA which becomes too large, causing the Huntingtin protein to fold the wrong way which results in the disease. "We believe that the DNA repair proteins cause this stretch of repetitive DNA to become even larger, and drive faster progression of the disease in some people." Dr Hensman Moss further explained that successes in the field of Huntington's disease can be beneficial to the wider field of dementia: "The genetic nature of Huntington's disease makes it particularly devastating for families who have it, but also gives it some advantages when it comes to studying the disease. We know who has the disease, and who will get it in the future (if they have had the genetic test). "This means we have been able to study the course of Huntington's disease from its earliest stages to learn about how it changes over time in patients. "There are drug trials underway using treatments that target this genetic error and the whole field of dementia awaits the results of these trials with great interest."